Being only 17 years old you can imagine how intimidated I was meeting all of those long time Doris fans. But even as I had just arrived they made me feel like family and welcomed me. They helped me find my way around, and I made lots of new friends. Just hanging out with them and getting to know them made the trip so much more enjoyable. I got the chance to do so many fun things while I was in Carmel but the best part of the trip was by far getting to speak to Doris herself! My whole body was trembling as we walked to where we would see her that sunny afternoon. I remember the feeling of standing down there listening to her speak in looking at her with her beautiful yellow hat on. Same old Doris I thought to myself. Getting the chance to talk to Doris was amazing. It was something I will never forget it. Now every time I watch a Doris Day movie or listen to one of her songs, I can't help but think that I have some kind of relationship with her, she calls all of her fans her friends. And I truly believe that I am one of her friends. 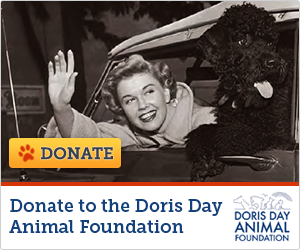 As we all are who love Doris. She has brought so much happiness into my life as I'm sure she has for most everyone who loves her. I hope that someday we can get another chance to talk to each other. I can't wait till April for another amazing trip to see Doris!